Been a bit busy, so no time for anything major. Here's a hypothetical drawing of the hypothetical/mysterious Tyrannosaurus X. 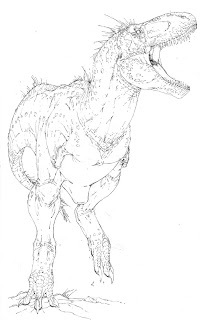 A possible gracile tyrannosaurus, that some believe is a separate species from the traditional Tyrannosaurus rex. I've been a longtime visitor to your blog (both this one and the one you share with Jess) mainly because I enjoyed the art and the photographs of dogs. The reason I'm commenting is because I recently read an article in a magazine (Discovery) that scientists finally found the third finger for Tyrannosaurs-Rex. I assume you're familiar with how there always had been a socket on the 'hand' that they assumed held the third finger? Did I said you "love Tyrannosaurs?" My bad, I'm so scattered-brain: I meant you seem to enjoy drawing newly-discovered dinosaurs or those that had new facts revealed about them. What was actually found was the remnant of the third finger. Basically the only bone that remains is what would be the palm bone for us humans. They just discovered an older T. rex relative that is 60 million years and that animal had 2 fingers. Hello Brett, I was just wondering if I could use one of your works (the Tyrannosaurus "x") for Wikipedia, the Free Encyclopedia. It is possible that this is the long-sought adult nanotyrannus?